Hundreds of Australian companies are using drones commercially. How do you become an attractive candidate for a drone pilot job? There can be many facets to a drone pilot job. It is common that a drone pilot job role is coupled with job components such as processing of information. That might be survey information, editing of video or writing of asset reports. 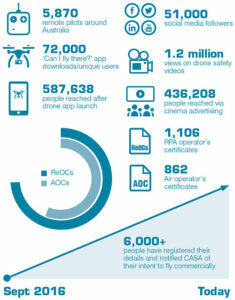 Drone pilot jobs, simply to fly the aircraft exist, but numbers are limited. Drones are undoubtedly saving Australian companies hundreds of thousands of dollars and most large companies are using them in some fashion. There are a number of things you can do to position yourself to gain a drone pilot job. Unfortunately some of the less esteemed training organisations use marketing hype to recruit new students on a promise of future success. So, what do you need to be successful? Firstly, drop the impression that you will be a millionaire overnight solely because you can operate a DJI Phantom legally. 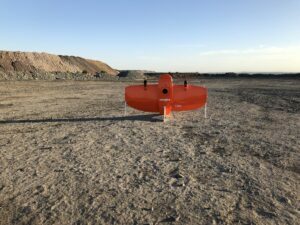 When incorporating new drone activities, or expanding current drone activities, a company has the option of taking on a new employee or upskilling a current employee. Recruiting is also a hard task for an employer, there is considerable risk in hiring the wrong person. Solely having a drone licence may not make you the most attractive candidate at the time. Spend some time researching the company’s use of drones, including software packages they may use to control the aircraft or interpret information. There is a list of all the Australian companies that hold Remote Operator Certificates, this means those organisations that potentially have the capacity for drone pilot jobs. At the time of writing this is some 1500 operators. The Remote Operator Certificate List can be filtered by region and application type. When applying for a drone pilot job position, it is expected that you come to the company with the correct licence type for the aircraft being operated. There are a number of different aircraft type used for different purposes. By far, the most versatile aircraft is the multirotor type , this aircraft is a good place to start. These days, the quality of training available for the Remote Pilot Licence varies considerably. The top training organisations will equip you with the skills and knowledge to be an asset to a future employer. There is also a good chance the top training organisations are known by prospective employers. Being a good drone pilot isn’t all about skills on sticks, there are many other facets of a drone pilot that are important to a company. Having a responsible drone pilot who follows company procedures protects the company. Ultimately the company is responsible for any incidents that occur. Consider the employer, employing people is not an easy task and this obviously extends to drone pilot jobs. Gain your initial Remote Pilot Licence with an organisation that understand both the technical and non-technical skills required to become an asset as a drone pilot. Once equipped with your Remote Pilot Licence, consider utilising the excluded category to gain some experience in low-risk areas. 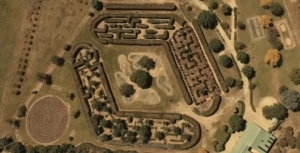 Consider upskilling yourself by enrolling in additional courses, such as the aerial survey training provided by Remote Results. Prince Harry and Princess Meghan have arrived in Australia and Invictus Games commences in Sydney this week. 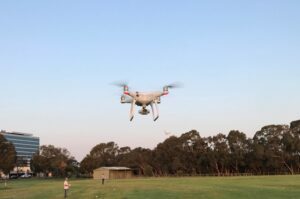 Temporary restricted areas have been established for the event limiting drone operations within the Sydney region for the duration of the event. The Invictus Games is the brainchild of Prince Harry and sees wounded veterans compete in a variety of events. The Sydney games sees 500 competitors from 18 countries compete in 11 medal events. Like other large events, the Invictus games has seen the establishment of Temporary Restricted Areas to limit drone operations to only those approved by the controlling authority, New South Wales Police. The Temporary Restricted Areas (TRAs) only apply to remote aircraft and do not affect piloted aircraft. The TRAs apply between the 18th and 28th of October and details have been published through an Aeronautical Information Circular H33/18 . New South Wales police will allow those holding a Remote Operator Certificate and approval to operate in the airspace during the Invictus Games. Remote aircraft operated in the excluded category or recreationally are not able to gain approval to operate within the TRAs. 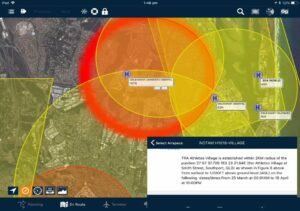 Unlike other TRAs, the Civil Aviation Safety Authority has added the Invictus Games TRA’s to the “Can I fly their app” helping drone users identify the affected areas. 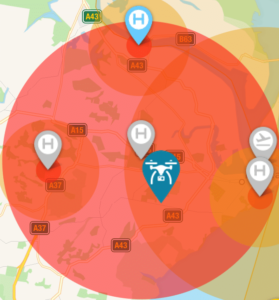 Professional drone operators utilising an electronic flight bag such as Avplan EFB will also note the inclusion of the temporary restricted areas. Piloted aircraft have not remained untouched, with a visit by the royals to the Royal Flying Doctor Service in Dubbo resulting in the airport being closed to all traffic except scheduled airline and emergency flights. 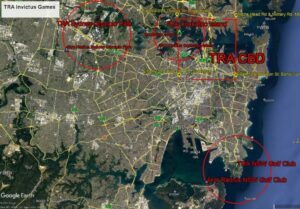 During the commonwealth games in Brisbane this year a drone was “shot down” (Commonwealth Games temporary restricted area results in police shooting down drone) by Queensland police after flying near the temporary restricted areas associated with the event. Flights within Restricted areas, without approval, can be subject to fines in excess of $4000 if prosecuted. Starting and growing a business can be a challenging prospect. 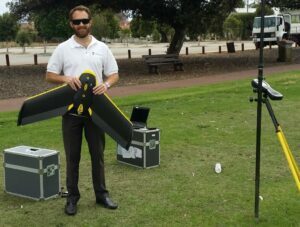 For Daniel Williams, a young Melbournian, visiting the World of Drones expo was key decision to grow a business out of his passion for drones. The World of Drones Congress is an international forum for everyone including business, government, investors and enthusiasts of drones, held annually in Brisbane. Aviassist, a commercial drone training company, exhibiting at the World of Drones congress offered Daniel a drone scholarship to a gain a Remote Pilot Licence (RePL). With stronger and clearer rules in place for operating drones for increased safety, this was a valuable development for the future of his involvement with drones. Since Aviassist launched in 2008 there has been a strong commitment to ensuring aviation activities are made safe, straight forward and stress-free, part of this commitment is community participation. One avenue is the provision of an annual drone scholarship to young Australians. Aviassist looks for those passionate about making a positive contribution to Australian business utilising drone technology. Daniel was chosen in 2017 as he was highly ambitious and motivated to succeed. Daniel was already operating a business in the excluded category, a category which does not require formal training or licensing. The restrictions in place for the excluded category are crippling in a business sense, limitations on where and what you can fly significantly limits the chance of being successful. Being licensed now means Daniel can fly better quality sensors, in more places with a level of protection expected by large clients. Following the completion of the training Aviassist provided mentorship for Daniel’s business DJ Aerial Photography to gain a Remote Operator Certificate (ReOC). Since completing the scholarship, Daniel’s business has incorporated larger aircraft capable of carrying multiple sensors to give a level of detail not previously available for his clients. Flights have been conducted at night and new sensors such as Forward Looking Near Infrared (FLIR) offer new income streams for his business. The team at Aviassist look forward to following his success. On Tuesday, Civil Aviation Safety Authority’s Director of Aviation Safety, Shane Carmody, signed an instrument relating to drone operations aimed to significantly reduce the chance of drone operations interfering with piloted aircraft. Today we announced new stronger and clearer rules for flying drones to help drone flyers operation with increased safety. They do not apply to all drone flyers. If you hold a remote pilot license (RePL) and operation according to a remotely piloted aircraft operator certificate (ReOC) or have an authorisation from CASA, you will be excempt from the new measures. 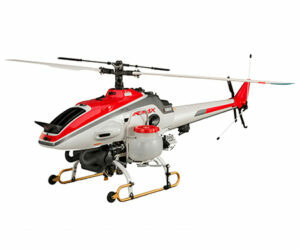 Model aircraft operating under CASA approvals are also excempt. The new rules essentially exclude unlicensed drone pilots from operating within 5.5km (3 nautical miles) of all but the smallest airports. Unlicensed drone operations are now prohibited in the vicinity of every airport whilst there are piloted aircraft operating. With the large quantity of flight training and other light aircraft operations that are conducted at secondary and regional airports around the country, the consequence of the rules is that there are now large areas throughout the country that are, effective immediately, no-go areas. The move certainly has clear aviation safety positives; under the prior rules drone pilots holding no aviation-specific training were able to operate in close vicinity to piloted aircraft. Whilst there were certainly very good operators who took the time to upskill, there has unfortunately been a significant number of operators who have not. The new rules appear to be a clear message from CASA, if you want to operate near piloted aircraft you need to be professionally trained and suitably qualified. The Civil Aviation Safety Authority (CASA) has been under increasing pressure as the senate enquiry into the regulatory requirements that impact the safe us of drones continues. The new rules do not apply to fully certified operators, presumably due to the increased situational awareness and aviation knowledge gained through the training for a remote pilot licence such as the courses offered by Aviassist. For those operators presently operating in the excluded category however it appears the restrictions will apply. There is an exclusion from the directive for persons who hold an ‘authorisation’ or ‘exemption’ from CASA. The Civil Aviation Act 1988 (Cth) dictates that exemptions must be in the form of a legislative instrument, no such instrument has been issued by CASA in relation to the excluded category. Presumably, the term ‘authorisation’ in the instrument refers to a ‘civil aviation authorisation’ which, according to the definition in the Act, appears to relate to something issued by CASA to an individual or entity such as a licence or certificate. CASA does not issue such documents to excluded category operators. Indeed by the very definition, excluded category operators are excluded from requiring authorisation. Obviously, the new rules will have a significant impact on the many thousand excluded category operators however given the relative ease in obtaining quality remote pilot training and certification, smart operators see this change as a further reason to differentiate and grasp the opportunity to move to a higher standard. 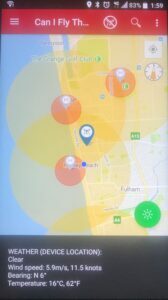 The Civil Aviation Safety Authority (CASA) should be highly commended on releasing the “ can I fly there ” app removing the need for interpretation in where unlicensed drone pilots can fly. The same rules don’t apply for certified drone operators and use of the “ can I fly there ” app will sell your business short. The ” can i fly there ” app is based around the excluded drone category rules. Since the release, there has been confusion on exactly where certified operators can operate flying under a Remote Operators Certificate. For example. 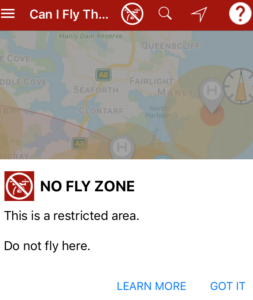 A client calls to conduct a job within Sydney harbour, checking the “ can if fly there ” app a “no fly zone appears for a restricted area. The procedures in the operations manual of a Remote Operator state how flights should be conducted around an uncontrolled aerodrome. 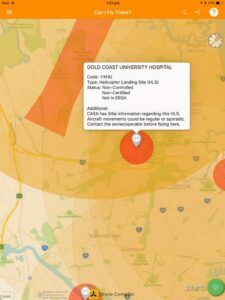 The restrictions in the CASA “ can I fly there ” app, with regard to heliports with an instrument approach do not apply, nor do the additional height restrictions or extra distance applied to departure and approach. The weather information in the CASA “ can I fly there ” app is uncertified at best, 16 gusting 26knots 5km away on inspection shows a wind of 11knots well within limits of most aircraft when conditions were most certainly unsuitable. 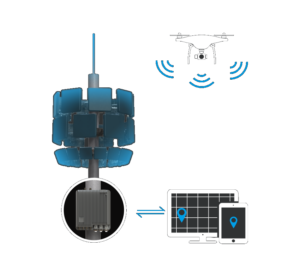 Professional operators should invest in an electronic flight bag such as Avplan (which app should I use) Any good training organisation has spent considerable time explaining the methods to ensure drone operations are safe in all areas. Relevant maps/charts and frequencies explained and support provided in the background for those trickier situations. While it may be tempting to use CASA’s free app, the investment of less than $100 for a good electronic flight bag will pay dividends to your business, training by a professional organisation will also pay dividends to your business.